The positives are clear. 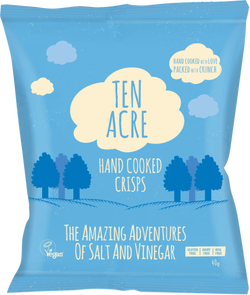 Ten Acre are a new addition to the UK Crisps market and they have immediately identified the need for bright, colourful statements related to the flavour inside. The broad, two colour packs certainly hit the mark. The fluffy cloud and countryside graphics are notable, although they could have placed the brand name in a third colour (they have used black on the reverse). Although it should be noted that three colour and full colour printing costs are significantly different for a start-up business. We do have a gripe though – each flavour is interestingly named: The story of when the Cheese met the Onion, The secret of Mr Salt, When the Chilli got sweet, etc. But, despite looking on the reverse, there are no stories. It would have been a neat marketing ploy to do as Phileas Fogg did so many years ago and actually write about the Amazing adventures of Salt and Vinegar. You certainly can’t expect customers to visit a website [without an incentive] to try to find out, however much you would like them to. In many ways these Crisps featured the perfect crunch. The deterioration was minimal as the crunch was sustained throughout the eating process. Yet there was not brittleness or sharpness of edges and angles. After emptying out into a bowl the most notable feature was that many of the Crisps were small. Closer inspection revealed that this was because their Hand Cooked nature had seen a dramatic alteration of the natural potato slice shape – there were some serious bends, curls and squiggles; some were even folded. Apart from that they were crisply yellow and featured lots of small oil blisters. A Nose Plunge Test revealed rather oily and almost muted Vinegar aroma. This was sort of replicated in the flavour, where the Sunflower Oil overwhelmed the both Salt and Vinegar. 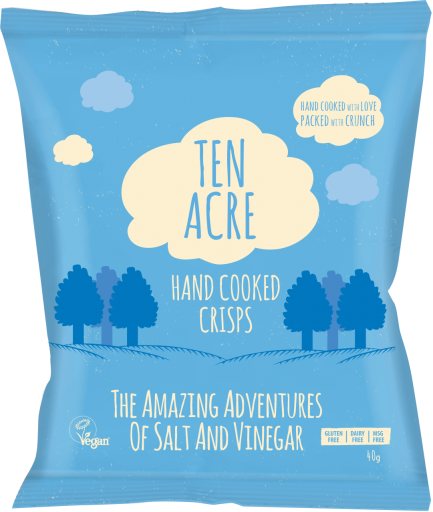 It was less an ‘Amazing Adventure’ and a gentle sojourn into the wide world of average Salt & Vinegar flavours.